Fiction – paperback; Faber and Faber; 320 pages; 2010. Review copy courtesy of the publisher. If I was going to recommend a light, entertaining read, something that goes down easily without having to think about it too much, I’d suggest this one. 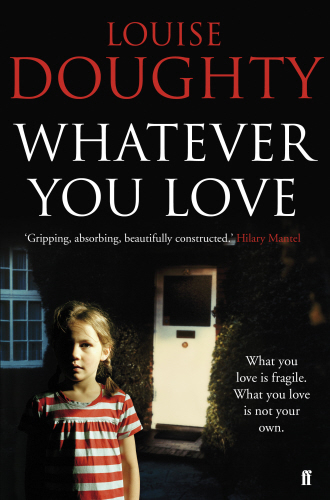 Louise Doughty‘s ninth novel, Whatever You Love, isn’t high-brow literature by any stretch of the imagination, but it is accessible and enjoyable, and I suspect when it’s released in trade paperback size it will do very nicely sales wise, thank-you very much. The story is told in the first-person by a young mother of two, Laura, who has just lost her oldest child, 9-year-old Betty, in a hit-and-run road accident. The tragedy occurs on the very first night Betty is allowed to walk to her after-school dance class, accompanied by her best friend, instead of being collected by an adult. Because of this key event in the novel, I had expected the narrative to be a fairly grim one in which Laura — a divorcee still coming to terms with her ex-husband’s infidelity three years earlier — wallows in despair. But while it features it’s fair share of hand-wringing and woe-is-me naval gazing, the book is more akin to a psychological thriller (think Nicci French) than a misery memoir. The tautly written narrative is split into four parts that alternate between Laura’s life before Betty’s death, and life after. From the outset there are clear hints that Laura, a part-time physiotherapist, is not the most emotionally stable person. In her youth she was burdened with the care of her widowed mother who developed Parkinson’s disease. Then, the first serious romance she experiences, turns into a feverish, whirlwind courtship bordering on sexual obsession. That romance turns into marriage, two children and a nice little terrace house in a British seaside town. But it all comes to an end when she suspects her husband of having an affair when their son Rees is just an infant. Paranoia ensues when Laura begins receiving anonymous telephone calls, only to be heightened when poison pen letters, blaming her for the marriage breakdown, begin to arrive. By the time of Betty’s death, Laura doesn’t need much to tip her over the edge. It’s only when she hits upon the idea of revenge — seeking out the driver responsible for killing Betty — that she enters morally dubious territory indicative of a disturbed mind. While the story never slides into all-out farce, it’s a little melodramatic in places. And if you can forgive Laura’s slightly wearing narrative voice, then you will appreciate Doughty’s portrait of a woman on the edge of a nervous breakdown. The setting — an unnamed English seaside town over-run by immigrant workers — has the requisite seedy atmosphere, although the community tension angle feels slightly forced. However, where the story works best is Doughty’s exploration of family relationships, particularly the ways in which parents are bound together forever despite any subsequent marriage breakdown. A portrait of bereavement, jealousy and rage, Whatever You Love is a tense, well-plotted read. If you liked Rebecca Frayn’s Deceptions it’s fair to say you’ll probably like this one too. I read one of her books in April, “Honey-Dew”, and I had rather great expectations. The beginning and the setting were fine, but in the second half it sort of petered out and left me rather disappointed. It sounds as if this one is much better. I sort of like the sound of this book, especially now I am warned not to expect too much (I don’t mind books like this at all – in fact I quite often enjoy them – so long as I know not to expect anything too much). I really enjoyed Rebecca Frayn’s Deceptions so maybe I should give this one a go? I can’t say I enjoyed this book, and I agree about it being a little melodramatic. It seemed to me a book of two halves – the first dwelling on Laura’s grief and her inability to cope, with the second concentrating on her instability, especially as she is pushed to the edge of sanity. I’ve not read any of her books before — she’s written 6 in total — so I can’t compare this to anything else. But as I state in my review, this isn’t high-brow literature. It’s simply something fun and entertaining. I certainly wouldn’t rush out and buy her entire back catalogue on the strength of this one. It’d make a good holiday read on your next trip abroad! I think you’re right; it is almost two books vying to be one. The first is a story of bereavement, the second a portrait of mental illness. But I guess they are linked, a kind of cause and effect.